Looking for an app that'll get the whole party talking? 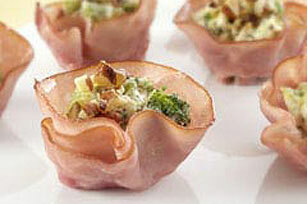 Try these cup-shape ham slices cradling cheesy broccoli, nuts and sun-dried tomatoes. Flatten ham slices. Press 1 ham slice onto bottom and up side of each of 24 mini muffin cups. Fill with broccoli mixture; sprinkle with nuts. Having a party? Assemble appetizers several hours in advance. Refrigerate until ready to serve. Bake, uncovered, as directed just before serving.